Last week, Alex at myrmecos tagged me with a fun new meme called These are a few of my favorite stings…. It’s simple – list the things which have stung you (biting doesn’t count), and tag three others for their tales of envenomization. Of course, being the dedicated myrmecologist that he is, Alex leads off with a most impressive list of venomous arthropods, and he selected worthy competition in buzzybeegirl and bugeric. But me? I have, for the most part, succeeded in avoiding stings by focusing on a group of insects (beetles) that never evolved such structures. My domestic list is short and mundane – honey bees, paper wasps, sweat bees, fire ants – and even those not very often. Alex, however, suspected I might have some tales from exotic lands – thus, I offer the following trilogy and tag Art, Doug, and Kolby. When I made my first Neotropical collecting excursion some 20 years ago to Ecuador, I was warned by my guide about large, black ants that he called “Congas.” I later learned the species to be what many people call the bullet ant (Paraponera clavata). Now, I’m not an expert on which arthropod truly has the most painful sting, but many people knowledgeable about such matters say it is this species – and I believe them! We were camped out in Sucumbios Province east of Nueva Loja (also called “Lago Agrio”) at an Amazon forest site where recent construction had left rows of month-old slash lining both sides of a 2-km stretch of new road through the forest – can you say woodboring beetles? I roamed up and down that stretch of road, picking a wonderful diversity of longhorned beetles (Cerambycidae) and jewel beetles (Buprestidae) off the slash. At one point, I encountered a whole tree crown laying by the side of the road that required some clambering to get at the beetles crawling on its inner branches. At one point, I braced myself with my arm against a branch and immediately felt an excruciating pain. I looked at my arm and saw one of these large ants clamped onto my arm and quickly slapped it off. I really don’t think words can describe how painful that sting was, and not only did it throb for the rest of the day, but I actually felt sick for the next several days (though I still managed to keep roaming the slash rows). I don’t know if the bullet ant I captured right afterwards was the one that stung me, but I still took great delight in impaling a #2 insect pin through its thorax after I returned home. Alex mentioned one plant – stinging nettle (Urtica dioica, which also lines one of my favorite mountain bike trails), but I’ve also had a run-in with a much more formidable plant in Mexico. Mala mujer (Cnidoscolus angustidens), which translates as “bad woman” in Spanish, deserves all the respect you can give it. Reported to be one of the most painful stinging nettle-type plants known, it grows commonly from the arid southwest down into the dry, tropical thorn forests of southern Mexico where my colleague Chuck Bellamy and I have made several trips in recent years to search for jewel beetles. One quickly learns to recognize this distinctive euphorbiaceous plant by its green palmate leaves with white veins and thick covering of yellow, stinging trichomes. Unfortunately, in my zeal for beating buprestids from Leucaena diversifolia (netting several of the rare Pelycothorax tylauchenioides and a now paratypical series of what was then an undescribed species of Agrilus), I forgot to maintain my lookout for this common understory plant and got a swipe across the knuckles. Not only did the extreme pain last for hours, but my ring finger began swelling so worrysomely that we stopped in a hospital looking for somebody to cut the ring off. My poor Spanish brought me no sympathy (or service), but fortunately the swelling began subsiding that evening and I didn’t lose my finger. I did, however, live with a rash for the next several days that developed into a hard, purple skin discoloration for the next several weeks. Bad woman, indeed! After arriving at the park [Borakalalo National Park, North West Province], I could hardly contain myself – I was so anxious to start collecting… We drove through the park for a little bit looking for a good spot to pull over and begin the hunt. After finding such a spot, I grabbed my trusty beating sheet and began doing what I have done so many times before – walking up to a tree, giving a branch a whack with the handle of my net, and hoping to see some prized buprestid laying on the beating sheet. The habitat was ideal for this – dominated by low, spreading acacias such as Acacia tortilis and A. karoo. Buprestids love acacias! I had already learned this in my travels through the American desert southwest and down into Mexico and South America – surely it was the same in South Africa. The first whack yielded nothing – typical. Even when collecting is good, buprestids are never “dripping from the trees,” and often one must literally beat dozens and dozens of trees to really get a good idea of the diversity and abundance of buprestid species that are active in a given area. I whacked a few more trees, with similar results. I then spotted one particularly large acacia tree – something about it said, “beat me!” I walked over to it and gave a branch a whack. All at once, it seemed as though the world was exploding! The air was suddenly abuzz with dozens of large, flying insects, whirring and swirling all around me. My first thought in that initial moment of terror was that I had whacked a hornet’s nest – who knew what kinds of deadly, venomous wasps one might encounter in Africa? Instinctively I ducked and started running, but within a few moments I realized that I was not being chased. Cautiously, I sneaked back towards the tree (after stuffing my heart back down my throat) and realized that they were not hornets after all, but instead beetles. I looked more closely and saw that the tree was literally alive with dozens and dozens of large, green cetoniines resembling our own green June beetle, Cotinis nitida (L.), which seemed to be attracted to the small, white blooms that covered the tree in profusion. I netted a few of the beetles, which I would later determine to represent the common savannah species Dischista cincta (de Geer) (Photo 2). 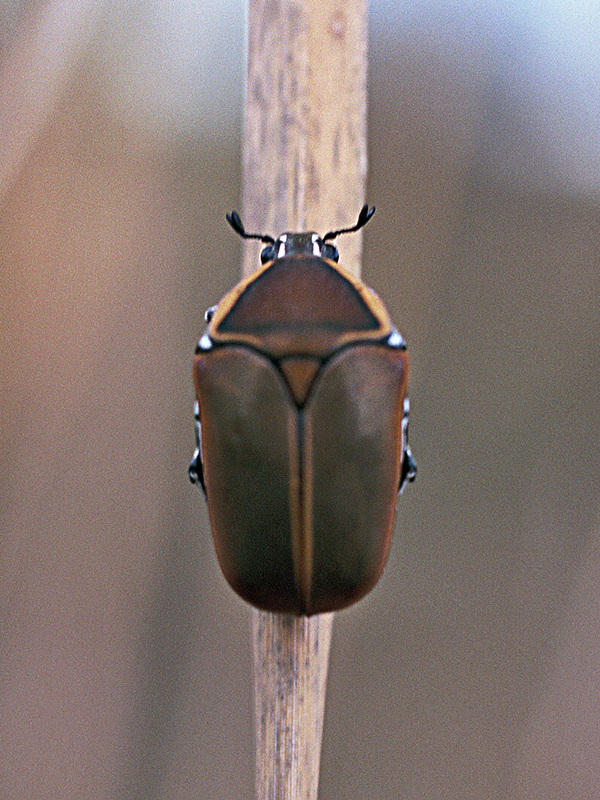 Such was my welcome to Africa, where it seemed the trees literally are ‘dripping’ with beetles! This entry was posted in Coleoptera, Euphorbiaceae, Formicidae, Hymenoptera, Scarabaeidae and tagged ants, beetles, blogging, Botany, Ecuador, entomology, insects, memes, nature, poisonous plants, scarabs, science, South Africa. Bookmark the permalink. Great stories, Ted!! I am very, very careful while walking in the bush and so far have not had any of these dangerous encounters with the wild side of insect photography. 🙂 But one day is one day …….. I can tell you about chasing lions out of camp though!! 🙂 But that would be a bite not a sting. No, just kidding, no bites but I did chase them and hyenas out before they could bite my guests. Some interesting and wonderful experiences!! Hi Joan, thanks. Yes, I’ve got a few good bite stories myself – maybe a good subject for a future post. I’m also always morbidly interested in Mexican emergency healthcare stories, as that’s always been back of mind when I’ve been traveling in the backcountry down there. Thanks, Alex. I’m glad myrmecos Alex included a plant in his list, or I might not have remembered about the mala mujer experience. I should mention that I got great sympathy from one Mexican citizen, who plead my case to the hospital staff to no avail. My wedding ring now bears the scars of my unsuccessful attempt to hack it off myself while we were driving around looking for a hospital. Oh man- a bullet ant?! I’ve never had the distinction of being tagged by one of those. Great stories- I knew you’d come up with a few juicy ones. Thanks, Alex. I bet you didn’t suspect I’d come up with the mother of all stings – it is a distinction you do not want! I love to read about adventures like this. Hi FWNP – that photo (and all others in the linked newsletter article) was taken with a now 27-year old 50mm F3.5 macro lens on an Olympus OM-10 film-SLR. I got the head in focus but not so well with the dorsal surface. It’s somewhat cropped from the original scan. Glad you liked the stories! Ah, field work. Those were great. Unfortunately I don’t have great war stories to go with most of my stings. Other than the red wasp fiasco in a certain cypress/tupelo swamp. That sucked. Hi cedrorum – well, you’ll have to tell us about that red wasp some time! Just reading your stinging adventures makes me want to scratch… Only wasps and bees for my part. Red wasps, ugh! The last two spring seasons we’ve been invaded by some type of red paper wasp that is somewhat aggressive. The darker colored ones don’t seem to bother anyone, but these red ones have actually chased me for 20-30 yards. I’m glad our stinging insect repertoire is fairly limited. I’m curious now as to what these “red wasps” everybody is seeing are. Maybe this? Apparently they get rather aggressive if you get too close to their nest. Our domestic list may not include things like bullet ants and such, but there are plenty of things here I wouldn’t want to get nailed by – cicada killers, tarantula hawks and centuroides scorpions to name a few. Happily, none of these things seem to be particularly aggressive. Must keep a watch out for those red wasps!